Please see the updates to this post below. I've got some jersey news from the junior leagues to share this evening. The QMJHL's Lewiston MAINEiacs are joining the other 59 Canadian Hockey League teams switching over to the Reebok Edge Uniform System for the 2009-10 season and this is your first look at what they'll be wearing. As is the case with all lower level teams, Lewiston is sticking with the standard, recognizable templates, with the Reebok logo front and center on the chest. The sweaters are similar to the Lightning for the darks, above, and Panthers for the lights, seen below. Nothing spectacular, but it's jersey news at a point in the summer when there's really not much else going on. Any thoughts on these? Are you excited about seeing leaked jersey pictures back on Icethetics again? 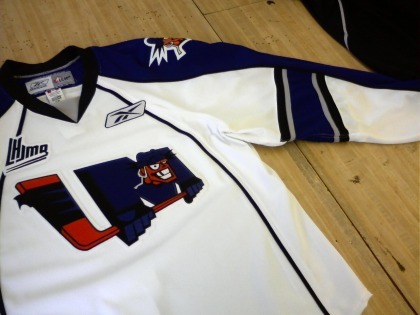 You asked for a comparison with the MAINEiacs' old jerseys. Here they are. This new look is definitely a downgrade but I think we've been hearing that a lot here in the Age of Reebok. My thanks to RicLaf for allowing me to nab his excellent photos from his Flickr photostream. 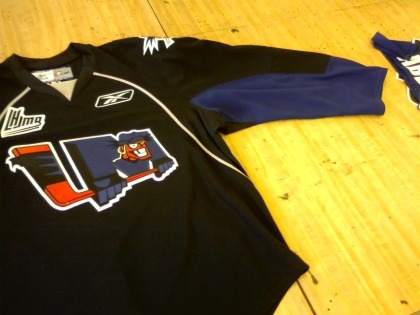 At the request of the QMJHL, I have removed the photos of the Lewiston MAINEiacs' new Reebok Edge jerseys. Icethetics is not in the business of making enemies out of the leagues. Sorry about that. With any luck, I hope to at least hear back with an official release date that I can post. The pictures will return to this post after the release.